#DancePassion 2019 live day saw performances from some of the UK's most exciting dance talent. All of the amazing performances were streamed live on bbc.co.uk/dance, but here are 9 videos showing some of the highlights of a fantastic day. 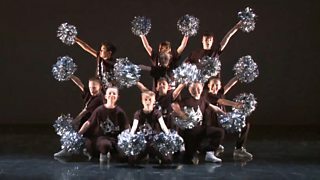 The DAZL Boys from Leeds are the UK’s only all-male cheerdance team and their energetic routine utilises pom poms, urban dance elements from hip-hop and breakdance, as well as tricks and flips. "Dance is a really important tool for improving young people’s physical and mental health whilst also bringing communities together." Motionhouse use a range of techniques from ballet, contemporary, circus, and acrobatics for their performance that showcases seemingly gravity-defying lifts from the company's female dancers. Candoco Dance Company's morning rehearsal from their company class is comprised of disabled and non-disabled professional dancers. The class sees dancers warming up, practising technique and undertaking improvisation exercises intended to prepare dancers for a day’s work in the studio. The hour-long class is led by Candoco's rehearsal director Susanna Recchia and soundtracked by the mesmerising sounds of percussionist Ronen Kozokaro. Rosie Kay's Five Soldiers included one dancer who is also a serving soldier in the Queen's Dragoon Guards. 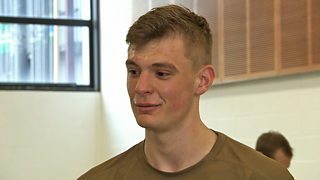 Trooper Alex Smith studied at the Northern Ballet School before deciding to join the army and has now been serving for over three years. Kay created Five Soldiers having had a vision-like dream following surgery to correct a serious injury that she suffered while dancing. Later, seeing footage from the Iraq war made Kay wonder how soldiers feel about risking death, given that her own livelihood was almost destroyed due to a work-related injury. Mentor Shane Shambhu rehearses a demanding solo performance that talented dancer Aishani Ghosh has been working on for over a year. "It’s a process that you’re constantly learning and you’re constantly evolving your movement." Dr Ranj Singh also gets involved, learning hand movements that are integral to a section of the overall dance routine. "We want to help young people tell their story through dance, to direct them in the messages they’ve got. We want people to know that being creative is amazing." 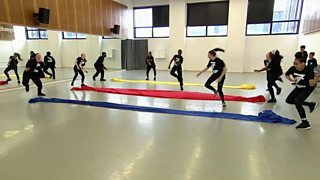 15 talented hip-hop dancers, aged between 10 and 20, present an excerpt from Bside, a new show about an individual with the power to help her community see in colour, rather than black and white. 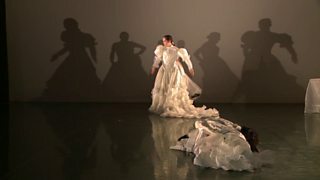 National Dance Company Wales invites three players from Swansea's Ospreys to join them for a performance. "Rugby is already like the national dance of Wales – a movement form and choreography that people understand." 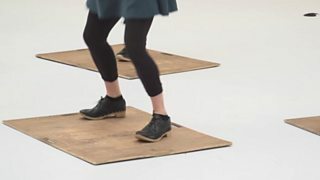 English Folk Dance and Song Society's Laura Connolly performs a routine and runs a workshop to try and entice six novices to try out the basics of clog dancing. The clog dancing champion's workshop includes her dancing to the Pink Panther theme tune in order to give a better understanding of the rhythms and timings needed for clog dancing. Gracefool Collective create post-intellectual, pseudo-spiritual, feminist comedy dance for the modern-day era. "We believe humour is a radical tool to transform ideas. Our work is about serious stuff... but without taking itself too seriously." 43 dancers. One staircase. One smartphone. One take. 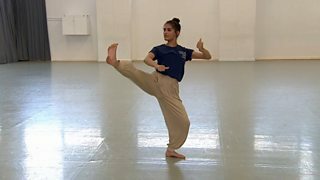 An extraordinary dance performance in BBC Scotland’s Pacific Quay building. Born in a German Prisoner of War camp the Reel of the 51st Division became a symbol of hope for Scots during World War Two. 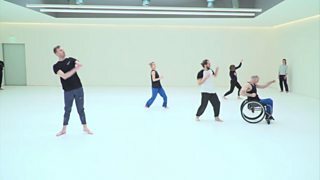 Stopgap Dance Company's ensemble of disabled and non-disabled dancers perform in a derelict suburban shopping mall. Relive #DancePassion live with all rehearsals, performances, interviews and workshops with dance companies from across the UK.